It was fascinating last week to read coverage of congressional hearings around the SOPA bill, or Stop Online Privacy Act. The bill has strong support from the Motion Picture Association of America, the U.S. Chamber of Commerce and big pharmaceutical companies. It's opposed by most technology and telecom companies, plus consumer advocate groups like the Electronic Frontier Foundation and Public Knowledge. I wrote about the Senate version of this bill, PROTECT IP, back in July. Some very smart people like Paul Vixie have pointed out how so-called "DNS filtering" won't stop access to pirated content online, but is a very dangerous precedent for how the Internet operates. It would also hamper the adoption of DNSSEC, which will improve online security. What's really interesting this week is how the tech giants are taking the message directly to the people. There's a well known term in Washington called Astroturfing, in which a corporate or political campaign is made to appear like a spontaneous, grass-roots movement. Other organizations are doing similar online messaging. As stated above, the technical objections to SOPA have been well illustrated. If the CircleID community will indulge an over-simplification, let's consider this policy struggle from a viewpoint not covered by the reporters above. Many online services are free or practically so, a far cry from a movie ticket. Considering that, can these efforts generate enough heat to make Congress back down? 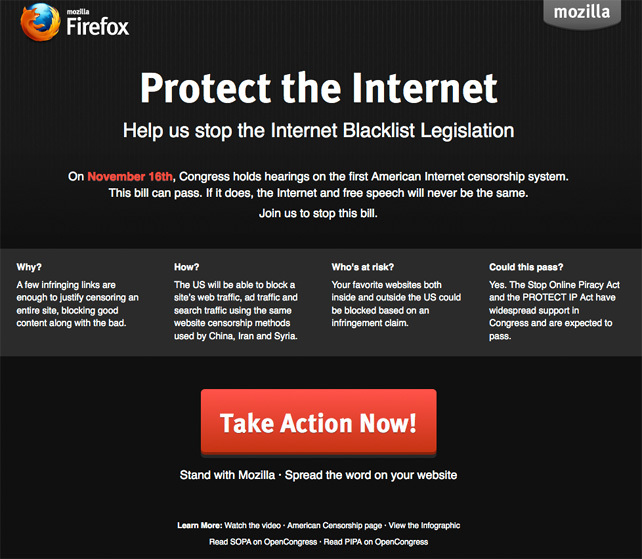 Was this 11th hour outreach the plan all along, or is this a Hail Mary since the more old school lobbying tactics of the pro-SOPA crowd seem to be working? I'd love to know how many thousands of Americans are clicking on the "Take Action Now!" button right now. Local Time: Friday, April 19, 2019 05:27 AM PDT – Page Load: 0.3734 Sec.